This entry was posted on Monday, March 14th, 2011 at 2:12 pm and is filed under Katy Community, Lost/Found Pets. You can follow any responses to this entry through the RSS 2.0 feed. You can leave a response, or trackback from your own site. 6 Responses to Another Lost/Found Pet Happy Ending in Katy! What a great story! I love that you do this Christi! It is such a valuable service to the community. 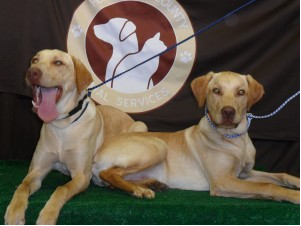 God bless the Murski’s that fostered these beautiful pups! Thank you so much for this valuable service! As a Lab owner myself, I know the owner of these two beauties would have been devasted if her pets had not been recovered. What a beautiful ending for what could have been a family pet tragedy. Kudos to the Murski’s. Christi thank you so much for this wonderful service. Lost female Pug dog in Avalon Katy on April Thursday 7; she has a damaged eye. We will appreciate your help. Thanks!